The Atomium has become a symbol of Brussels. Brussels is different than the other popular destinations that can be visited during a cruise ship call in Zeebrugge. Whereas Bruges, Ghent and Ypres are relatively small towns that are defined by their history, Brussels is a major urban center, which as the capital not only of Belgium but of the European Union, is very much of the moment. Thus, while Brussels has historic sites, it has the cultural attractions, shopping, cafes and restaurants of a modern city. Duke Charles of Low Lotharinga is often credited with founding Brussels in 979. The city quickly grew as it was on the trading route between Bruges, Ghent and Cologne. Over the centuries, Brussels changed hands several times. It came under the control of the Hapsburgs and later it became part of France. After the defeat of Napoleon in 1815, it became part of the Netherlands. The revolution of 1830 brought Belgian independence. Queen Victoria's unclle, Leopold of Saxe-Coburg, became the first king and Brussels became his capital. Today, the city of Brussels has a population of over 1.2 million people. Some 27 percent are foreigners reflecting the fact that Brussels is not only the seat of the European Union but that it is also the headquarters of NATO. Brussels is the largest city in Belgium. Cruise ships calling at Zeebrugge, often, but not always offer a shore excursion to Brussels. The capital is about 70 miles from Zeebrugge and the cruise line brouchures estimate that it will take a coach about an hour and a half to make the journey. A train from Blankenberge to Brussels via Bruges takes over an hour but then you do have to get to and from the railway stations. Brussels has a modern public transportation system that includes an underground, trams and buses. The Lower Town, the historic city center, is relatively compact and lends itself to walking. The newer Upper Town is more spread out. As in most big cities, there are hop-on, hop-off sightseeing buses. On this occasion, I elected to take the ship's sightseeing expedition to Brussels. As predicted, the bus took about an hour and a half to reach Brussels. The first stop on this tour was the Grand Place (Grote Markt) in the Lower Town. 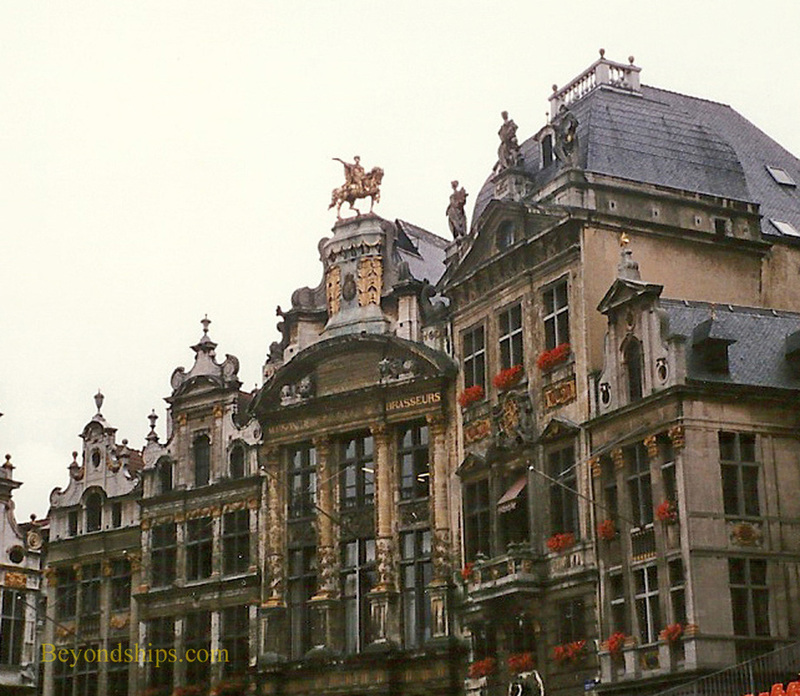 Once the city's main market square, the Grand Place is now a center of activity in Brussels. Indeed, on the way that we were there, preparations were underway for an evening festival. Surrounding the Grand Place are historic buildings.. On one side is the Gothic Town Hall originally built in 1402. 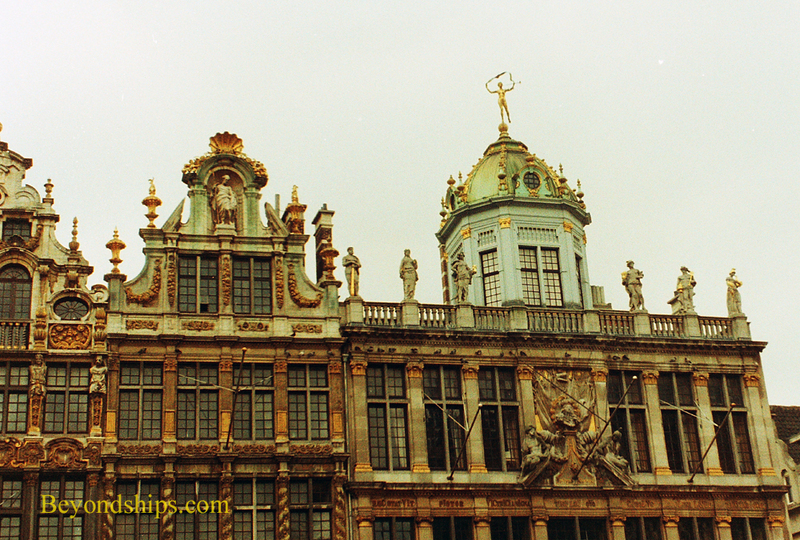 (Most of the buildings in the Grand Place had to be re-built after Louis XIV's army bombarded Brussels in 1695). Facing the Town Hall is the King's House, built by the Duke of Brabant in the early 16th century as an aristocratic reply to the bourgeois Town Hall. It is now the Museum of the City of Brussels. What is particularly memorable about the Grand Place are the richly decorated guild halls that populate the sides of the square. Gilt statues and other decorations cover their roofs and facades. Above and below: Elaborately decorated guild halls in the Grand Place. Above: The Manneken Pis dressed for a festival. A short walk from the Grand Place is Brussels' most famous and peculiar landmark. It is a small statute of a boy urinating. 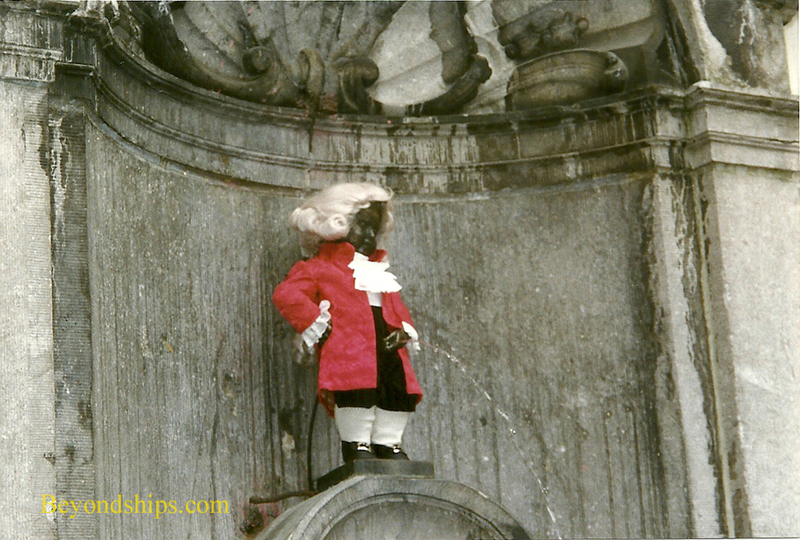 Despite the unusual subject matter, the citizens of Brussels adore the Manneken Pis. For holidays and festivals, the 24 inch high statue is clothed in costumes. Supposedly, he has over 700 such costumes. Furthermore, on some occasions, the water jetting from the statue is replaced with Belgian beer. No one really knows why the statue is there. One story that has some currency is that it commemorates the time when a small boy foiled a bomb plot by urinating on the explosives. The current statue is from 1619 and attributed to Jerome Duquesnoy the Elder. 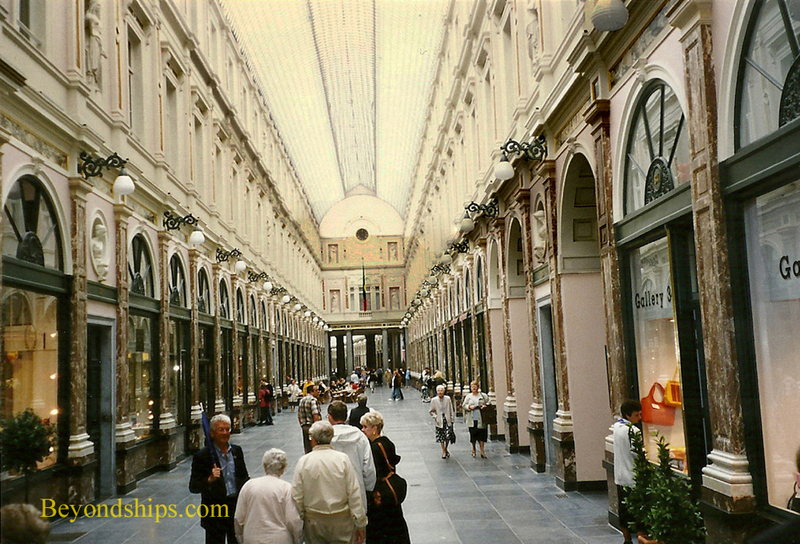 On this portion of the tour, we also walked through the Galeries Royales Saint-Hubert. Built in the 1840s, this was one of the first modern covered shopping arcades in Europe. It replaced a rundown area with an elegant precursor to today's malls that attracted people of fashion. Today, it contains shops, cafes and even a small theater. For our next stop , we drove to the Cathedral of St. Michael and St. Gudula, which is named after Brussels' two patron saints. It is believed that there have been churches on this site since the 9th century. The current Gothic structure was begun in the 13th century and took some three centuries to complete, replacing an 11th century Romanesque church. In addition to being a cathedral, St. Michael and St. Gudula is the national church of Belgium. It is here that the Royal Family come for coronations, royal weddings and other state occasions. With the exception of a period of free time in the Lower Town, the rest of the tour was on the bus passing by various places of interest. Some of the places we saw are discussed below. The Atomium has become the symbol of Brussels. Built for the World's Fair of 1958, it was erected as a tribute to the atomic age. Designed by engineer Andre Waterkeyn, it represents an iron atom enlarged 165 billion times. 335 feet tall, the spheres house a museum and a restaurant while the tubes house stairs and escalators as well as an elevator in the central tube. Although away from the center of the city, the Atomium is one of Brussels most visited attractions. On the crest of a hill, a triumphal arch over a road way links two vast colonnades. This is the Palacis du Cinquantenaire. 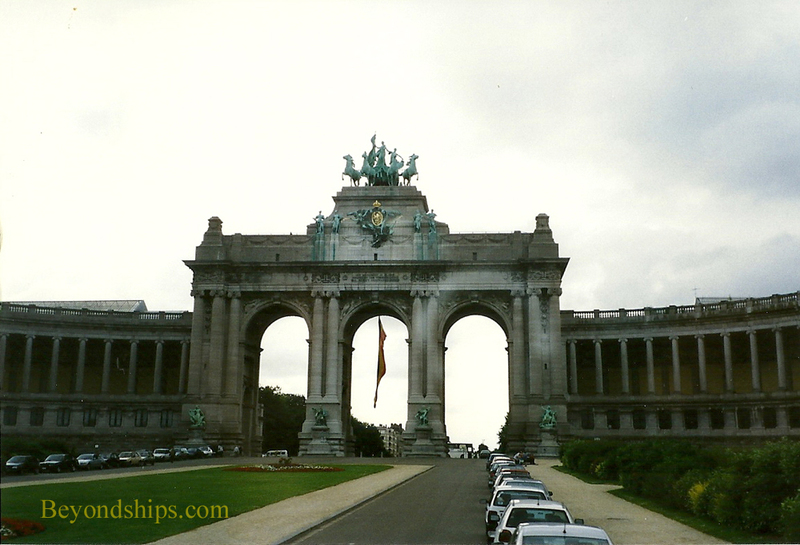 The arch links the Royal Art and History Museum on one side to the Belgian Army Museum and Museum of Military History on the other side. Later, we had a glimpse of another part of the Royal Museum of Art and History. King Leopold II was impressed by the Asian architecture he saw at the Paris World' Exposition of 1900. Accordingly, three Asian-style buildings were commissioned to be built near the royal estate. These became the Museums of the Far East. They are currently closed for security reasons. You cannot see everything worth seeing in a major city during a one day tour. At best, you get the flavor of the town and ideas for further exploration. Below left: The Palais du Cinquantenaire. 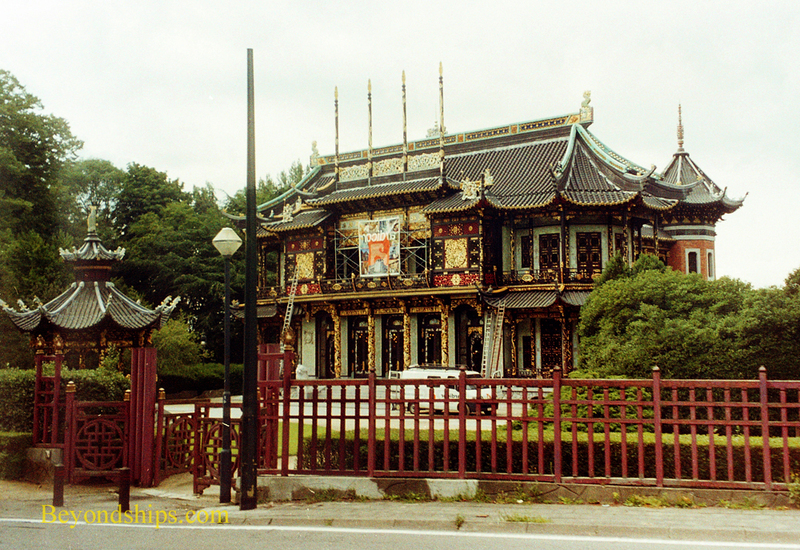 Below right: The Chinese Pavilion at the Museums of the Far East.